The current process for the design of an urban master plan typically involves a team of architects and urban planners that conceive a handful of schemes based on zoning requirements with the help of CAD software. They may intend for the plan to achieve a set of performance goals (economic, environmental, etc. ), but quantitative analysis is rarely conducted early and consistently through the design process. This makes it difficult to understand the full range of approaches that are possible on a site, and the relative performance of each scheme. In order to best accommodate rapid urbanization while making cities more sustainable, livable, and equitable, designers must utilize quantitative tools to make informed decisions about their designs. Computational design techniques have been successfully used at the building scale to test numerous designs and quantify their performance, but are challenging to apply at the urban scale due to increased computational expense, difficulty in limiting inputs, and more stakeholders involved in the process. This paper outlines a methodology developed in practice for applying computational design at the urban scale through four steps: 1) Simplified Input Definition 2) Procedural Geometry Generation, 3) Performance Evaluation and 4) Analysis & Communication to generate and test thousands of master planning scenarios. Explore the design space from the Demonstration section here! Our Director Luc Wilson traveled to Delft to present our paper on exploring potential frameworks for performance based zoning. Exponential growth is pressuring cities around the world to reevaluate their management of new development. Challenges stemming from such growth, including crises in affordable housing and transit accessibility, see cities responding by constructing ever greater densities, a process limited by current zoning regulations. Traditional zoning frameworks are rigid and slow to adapt, making it difficult for development to keep pace with greater density requirements. By establishing certain baseline urban metrics tied to a set of performance standards, performance-based zoning allows cities to proactively accommodate growth and demand while mitigating potential negative externalities. One of the primary challenges for a truly performance-based zoning methodology is defining and calibrating desired performance standards. Cities must consider criteria associated with, for example, comfort, mobility, and activity in such a way that defines achievable, goal-oriented benchmarks– a difficult task given the complexity of urban systems. In proposing a process for creating a performance-based zoning framework, this paper: 1) explores urban analysis methods, focusing on urban comfort, mobility, and activity, to create new urban performance datasets for Manhattan for use in establishing new zoning protocols, and 2) develops new visualization techniques that can more effectively engage stakeholders, make data understandable and accessible for decisionmakers, and broaden the discussion to involve a wider range of non-specialist participants. THE KEY TO A MORE EQUITABLE NEW YORK IS A NEW MODEL FOR PUBLIC TRANSIT – ONE THAT UNLOCKS THE POTENTIAL FOR AUTONOMOUS VEHICLES (AVS). In collaboration with ARUP, MIT, IBM and Data & Society. As we question the nature of the urban landscape, we predict a world with renewed public space and a better life for millions of New Yorkers. AV technologies will act as a catalyst, transforming the city into a place of more connection and activity, and redefining what it means to be “urban” for cities around the world. A reinvention of public transportation requires thorough understanding of all of the city’s intricacies and a design approach that is far outside of the box. With leading specialists at IBM, Arup and MIT, KPF is working to develop urban data and performance analytics and machine learning models to evaluate the opportunities for an integrated AV transit system. With greater knowledge about population densities, demographics, traffic patterns, street geometries, and subway capacity, we can explore the number of people a new system can support, density and growth factors, and ideal trip distances. Moreover, we can analyze the possibilities for street redesign, implementation and phasing, and land use changes across the city. Improved accessibility will dramatically alter land use and development trends citywide. Commercial and manufacturing can be paired with residential zones, connected by AV corridors that alleviate long and inefficient commutes. This new approach to mobility may lead us to adjust zoning policies and encourage a more balanced distribution of growth. Current and proposed dedicated transit network. Without rezoning, under-built sites with new transit access can meet NYC growth projections for 2030: House 1/2 million people and60 million sq ft office. We propose a network of AV corridors that will proliferate throughout the five boroughs, enabling New York to offer more equitable and effective transit, and redesign its streets for the comfort and benefit of its citizens. AV routes can act as a complement to existing transportation services, and connect to many areas of the city that are currently under-served. Multi-modal Streets: The promis of semi-autonomous transit. AVs operate with a vastly different set of assumptions than today’s cars, using advanced communication technologies that make them more efficient and safe. Their enhanced predictability will eventually allow entire lanes of traffic to be eliminated from the current streetscape, opening the space up for sidewalks and public use. New street typologies will be designed to accommodate the new infrastructure and allow New York to reprioritize the pedestrian and add acres of green space. 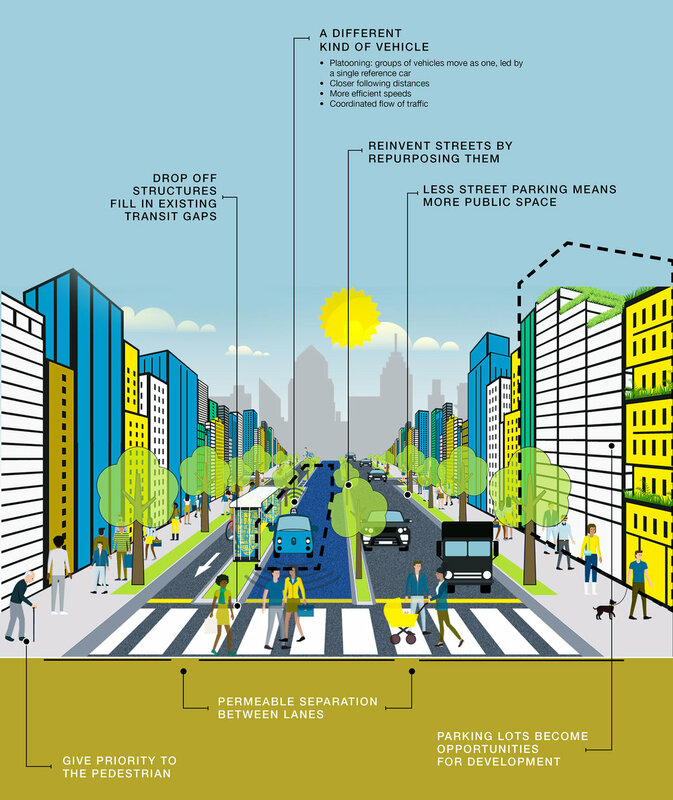 With the advent of AVs, New York can implement a new street design and zoning strategy that offers the most value for its most important asset – its people. In collaboration with The Visualization and Data Analytics (ViDA) lab at the NYU School of Computer Science and Engineering. Cities are inherently dynamic. Interesting patterns of behavior typically manifest at several key areas of a city over multiple temporal resolutions. Studying these patterns can greatly help a variety of experts ranging from city planners and architects to human behavioral experts. Recent technological innovations have enabled the collection of enormous amounts of data that can help in these studies. However, techniques using these data sets typically focus on understanding the data in the context of the city, thus failing to capture the dynamic aspects of the city. The goal of this work is to instead understand the city in the context of multiple urban data sets. To do so, we define the concept of an “urban pulse” which captures the spatiotemporal activity in a city across multiple temporal resolutions. The prominent pulses in a city are obtained using the topology of the data sets, and are characterized as a set of beats. The beats are then used to analyze and compare different pulses. We also design a visual exploration framework that allows users to explore the pulses within and across multiple cities under different conditions. Finally, we present three case studies carried out by experts from two different domains that demonstrate the utility of our framework. of these attributes on the character and value of a neighborhood. between architects, planners and developers. quality expectations in coordination with other goals of the project. building design options based on adjustable view preferences. features of this function are then used as candidate building designs. of potential building designs based on the given view preferences. Luc Wilson and Jesse Keenan, Center for Urban Real Estate, Columbia University. The virtues and drawbacks of supertall skyscrapers in New York are the subject of much debate, but their true impact is hard to measure in the absence of an analytical approach. MAS partners Columbia’s Center for Urban Real Estate and KPF will delve into the “science of supertalls,” presenting a series of quantitative methods and qualitative interpretations for understanding the nature of new development in urban contexts. This analytical approach is contextualized by projects from around the world. Presentation given at the Municpal Art Society, 2015 Summit for the City of New York.